For those of you who do not follow me on Instagram or Flickr I posted this photo in the wee hours of the night.. Since picking up a couple C-41 developing kits I have been banging out a bunch of rolls I have been sitting on for the last two or so years. This photograph was shot using a Holga on Kodak Ektar 100. I have about 15 more rolls to get through and I couldn't be more excited! It has been far to long since I sat down and did one of these! Releasing homespun... and getting everything ready for the art crawl in April has really sucked up pretty much all of my free time. Today I picked up a new Epson scanner which allows me to start scanning all the 35mm negatives I have been sitting on for the past couple years. So I'm starting to go through them trying to sort and archive everything. I found some real winners that I will be posting throughout the week but I will start with these! Alright so that was a small tease of what's to come in the next couple of days! I hope everyone had a great weekend! It feels great to be back! Sorry for the lack of POTD posts recently! I've been working so hard on the release of homespun... I've been searching for places interested in hosting a small gallery/release show for the book for the beginning of April! I might just have to do it during the Art Crawl first Friday April 3rd in Franklin at the Presbyterian Church due to the fact that I am already on the books for that date! I have a couple announcements coming up next week that include my "Minimalist Darkroom" class I'm planning on starting along with a few other things I have planned for the summer. Again thanks for all the support!!! Don't forget to order your copy of Homespun!!! The book is finally finished!!! It's official friends and followers! "Homespun..." my very first ever book of photographs is now available for purchase! I've spent the past year compiling photos of this wonderful town of Franklin, Tennessee and the people in it! This project has opened me up to so many opportunities and I just would like to thank everyone for all the support, encouragement and kind words! This wouldn't have been possible without you! Again, thank you all so much for the support! make sure to order your copy today!!! Every once in a while while making my way around town at night I take a couple of the blurry road shots. I can't even count how many of these pictures I've taken. Just something about letting the shutter drag the image works for me. Just gives it a real weird erie vide that I enjoy. I will probably one day put together a little series of these. That's about it for now! Hope you had a good Monday and I will see you tomorrow! Sorry for the late POTD posts the past couple of days!!! I've been spending every free moment in front of my computer working hard on the layout for my first photography book! I can't express how excited I am to be so close to finishing this thing. I opted to go with Blurp to do the printing and they offer software for free to download that makes everything super easy. I was going to stick with only doing black and white print but seeing that it really didn't affect the price adding color I choose about a half a dozen color photographs to add to sort of act as a separation to the different parts. As soon as I submit everything and get one in my hands I will be making an announcement with the title and release date along with price and where they will be available! Super super super excited!!!! I hope everyone stay dry and warm today! Funny find for the POTD! I totally forgot to post yesterday!!! I shot this picture this morning of my cat Niko using Fuji FP100c instant film on my Mamiya RB67. 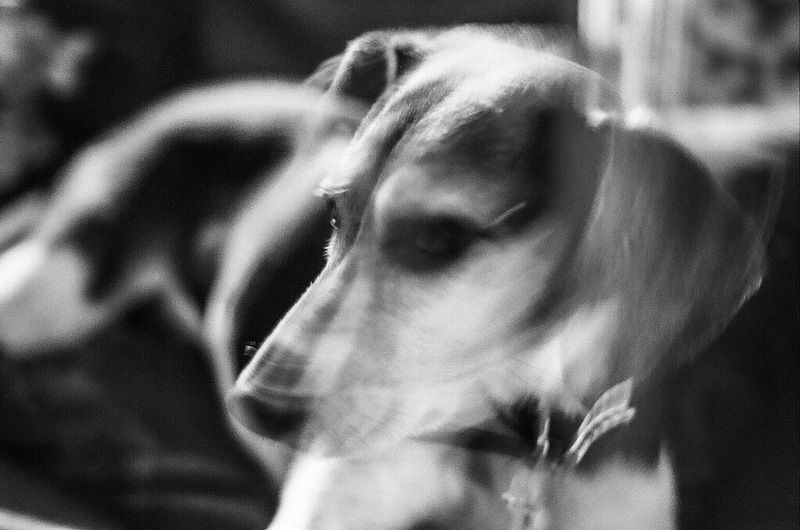 I had one exposure left and I still can't believe that he didn't move once he heard the shutter click. Also if you didn't catch my Facebook post yesterday I have some of my work hanging up in the back hall of the Starbucks on 5th and Main in Downtown Franklin! So if you're in the area swing through and take a look! Have a great day and try to stay warm!!! It's freezing! Here is a couple photographs from yesterdays ice storm! This was taken over a week ago on my Argoflex using Kodak tri-x. I filled up two rolls of black and white today along with taking some impossible project instant photos. I'm going to develop those rolls tonight so be ready to see a deserted ice filled Downtown Franklin! Hope everyone is warm, safe and enjoying this quiet time! One more eerie driving photograph! This is a long exposure using Fuji FP100c instant film. A little different from the norm. I just love the expression on the women's face on the left. Then there's the hanging baby! I have really grown to love random street portraits and all the wonderful subjects I'm given every day living in Franklin, TN. I have a small surprise to announce tomorrow! So stay tuned in for that! This was taken last week on a chilly Thursday. It was the first picture taken that day and I remember debating whether or not to take it. I obviously pushed the button and this photograph was made. This picture says so much to me. I'm putting together an ETSY store to start selling prints, zines and eventually my first book when that gets all wrapped up. I will link that all up to my site here in the upcoming week. I hope you're enjoying the sunshine today! I'll see you tomorrow! May Day from a while ago! can it get any colder! I shot this on old expired Kodak Gold 200 sometime over the summer. It just reminded me how I can't wait for spring to get here! Yesterday I took a day off from my POTD project but I'm back in full effect with a ton of new pictures to post! I hope everyone enjoyed the warmer weather we had this weekend! Here's to the start of a new week!!! Got stuck at work late and miss the art crawl tonight. Bummer. One of my favorites from yesterday. I always have trouble framing up the Presbyterian Church but I found this angle yesterday while taking a quick break to reload the camera. The picture also tells the viewer where we are with the Williamson County head stone. I find something new to shoot everyday. Hope everyone is enjoying this sunny weather! See you tomorrow!